Slevin ML, Stubbs L, Plant HJ, Wilson P, Gregory WM, Armes PJ, Downer SM. Imperial Cancer Research Fund, Department of Medical Oncology, St Bartholomew’s Hospital, London. OBJECTIVE–To compare responses of patients with cancer with those of a matched control group, cancer specialists, general practitioners, and cancer nurses in assessing personal cost-benefit of chemotherapy. DESIGN–Prospective study of consecutively recruited patients with cancer and other groups by questionnaire; half of the patients received the questionnaire again three months after starting treatment. SETTING–A medical oncology ward of a London teaching hospital. SUBJECTS–106 Patients with newly diagnosed solid tumours referred to the unit for consideration of treatment with cytotoxic chemotherapy, 100 of whom were able to complete the questionnaire. 100 Matched controls, 315 cancer doctors (238 radiotherapists and 77 medical oncologists), 1500 randomly chosen general practitioners, and 1000 randomly chosen cancer nurses. MAIN OUTCOME MEASURES–Percentage chance of cure, prolonging life, or palliation of symptoms required to make treatment worth while with two hypothetical chemotherapy treatments, with severe and mild side effects respectively. RESULTS–Respondents to the questionnaire comprised 100 patients, 100 controls, 60 (78%) medical oncologists, 88 (37%) radiotherapists, 790 (53%) general practitioners, and 303 (30%) cancer nurses. Most patients were willing to accept intensive chemotherapy for a very small chance of benefit. The median benefit required to make the hypothetical intensive treatments worth while for patients compared with controls were: for chance of a cure (range 1 to 100%) 1% v 50%, for prolonging life (range three months to five years) 12 months v 24-60 months, and for relief of symptoms (range 1 to 100%) 10% v 75% respectively. There were no significant differences in the responses of the 50 patients completing the questionnaire on a second occasion. Doctors and nurses were less likely to accept radical treatment for minimal benefit compared with the patients (median scores 10-50%, 12-24 months, and 50-75%, for chance of cure, prolonging life, and relief of symptoms respectively). Significantly more patients than controls accepted treatments giving the minimal benefit for each category (cure 53.1 v 19.0%, 67.0 v 35.0%; prolonging life 42.1 v 10.0%, 53.0 v 25.0%; relief of symptoms 42.6 v 10.0%, 58.7 v 19.0% for intensive and mild treatments respectively, p less than 0.001) as was the case for comparison of patients with other groups. CONCLUSION–Patients with cancer are much more likely to opt for radical treatment with minimal chance of benefit than people who do not have cancer, including medical and nursing professionals. This could be taken into account when discussing treatment options with patients and their relatives. 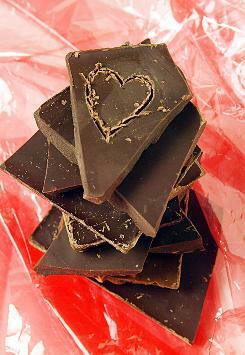 Chocolate for your heart too! Who does your doctor work for?